Computers and brains both work electrically. Silicon-basd computers utilize electrons as their charge carriers, on the other hand, neurons utilize ions in fluid as the major charge carriers. Electrons in silicon have a mobility of about 10^3 cm2/Vs, whereas the mobility of ions in water is around 10^-3 cm2/Vs. The difference of mobility is the fundamental difference of these two information processors. This website explores the detailed differences between these two information processors at the molecular level. Also, the electrical interfacing of individual nerve cells and semiconductor microstructures is demonstrated, as well as the assembly of neuronal networks and microelectronic circuits. The integration of neuronal network dynamics and digital computation on a microscopic level is beneficial for studies in brain research, biosensorics, information technology and medical prosthetics. The figure above shows a neuron-silicon chip with an inidvidual nerve cell from rat brain and a linear array of transistors. This nerve cell (20 um in diameter) is surrounded by a membrane with an electrically insulating core of lipid. This lipid bilayer (5 um in thickness) separates the environment with about 150 mM sodium chloride from the intracellular electrolyte with about 150 mM potassium chloride. Ion currents through the membrane are mediated by specific protein molecules. These ion channels have a conductance between 10 pS and 100 pS. Silicon is chosen to be the electrically conductive substrate for three reasons. First, coated with a thin layer of thermally grown silicon dioxide, silicon is a perfect inert substrate for culturing nerve cells. Second, the thermally grown silicon dioxide suppresses the transfer of electrons and the concomitant electrochemical processes that lead to a corrosion of silicon and to a damage of cells. At last, a well established semiconductor technology allows the fabrication of microscopic electronic devices that are in direct contact to the cells, shielded by the inert oxide layer. When nerve cells grow on a chip, they deposit cell adhesion proteins to provide cell anchorage. These proteins keep the lipid core of the membrane at a certain distance from the substrate, stabilizing a cleft between cell and chip that is filled with electrolyte. The conductive cleft shields electrical fields and suppresses a direct mutual polarization of silicon dioxide and membrane. The cell-silicon junction forms a planar electrical core-coat conductor: the coats of silicon dioxide and membrane insulate the core of the conductive cleft from the conducting environments of silicon and cytoplasm. The activity of a neuron leads to ionic and displacement currents through the membrane. The concomitant current along the core gives rise to a Transductive Extracellular Potential (TEP) between cell and chip. Meanwhile, a voltage transient applied to silicon leads to a displacement current through the oxide coat, thus a TEP appears between chip and cell due to concomitant current along the cleft. In the second step of interfacing, the TEP in the core-coat conductor is detected by voltage-snsitive devices in the chip or in the cell. 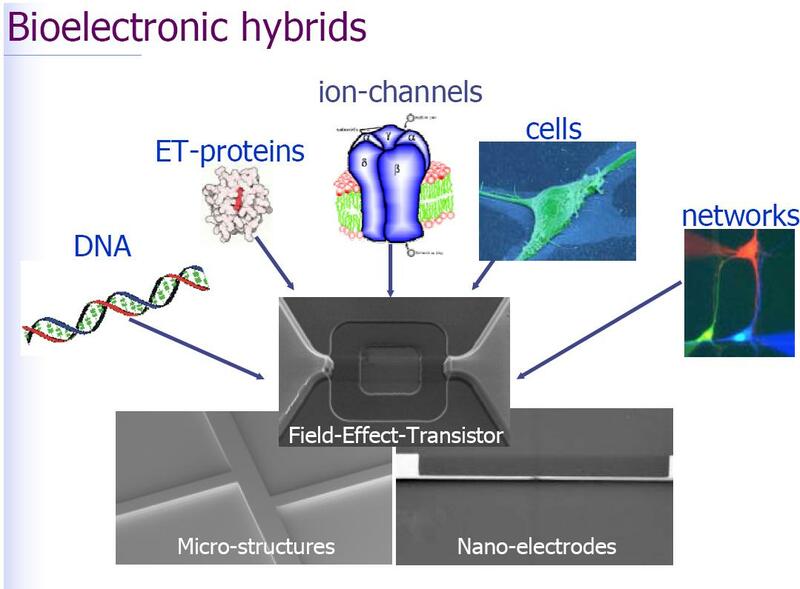 The TEP induced by the neuron gives rise to an electrical field across the silicon dioxide that is probed by a field-effect transistor, and the TEP induced by the chip gives rise to an electrical field across the membrane that is probed by voltage-gated ion channels. The interfacing of neuron and semiconductors is mediated by a Transductive Extracellular Potential. A large TEP results from high currents through membrane and silicon dioxide, and from a low conductance of the junction. Recording and stimulation of neuronal activity are promoted by a small distance d, a high specific resistance p, and a large radius a of the cell-chip junction. Efficient recording requires high ion conductances g in the attached membrane, efficient stimulation a high area specific capacitance c of the chip. The lipid core of a cell membrane and the silicon dioxide layer of a silicon chip are not in close contact. The large distance is caused by dangling polymer molecules that protrude from the membrane and that are deposited on the chip. They give rise to repulsive entropic forces that balance the attractive forces of cell adhesion between the integrins in the membrane and laminin molecules. It will be an important task to lower the distance of cells and chips by special treatments of the chip surface and by genetic modifications of the membrane without imparing the viability of the cells. The cleft between neuronal cells and chips has an electrical resistance that corresponds to a thin film of bulk electrolyte. The sheet resistance is in the order of 10 M-Ohm with a global resistance around 1 M-Ohm. There is no gigaohm seal between neuronal cells cultured on a chip. It should be noted that the width of the cleft is far larger than the thickness of the diffuse electrical double layer at the silicon dioxide and at the membrane with a Debye length around 1 nm in 100 nM NaCl and also far larger than the Bjerrum length 0.7 nm of Coulombic interactions which governs the interaction with image charges in membrane and silicon dioxide. It will be a difficult task to enhance the sheet resistance by lowering the width or by enhancing the specific resistance of the cleft. The combination of transistor recording with whole-cell patch-clamp shows that functional ion channels exist in the area of cell adhesion. Important for neuronal interfacing and cellular biosensorics is the observation that ion channels are selectively accumulated and depleted. A control of the expression and sorting of ion channels is an important task to optimize cell-chip contacts. The field-effect transistor (FET) is a type of transistor that relies on an electric field to control the shape and hence the conductivity of a 'channel' in a semiconductor material. All FETs except J-FETs have four terminals, which are known as the gate, drain, source and body/base/bulk. Compare these to the terms used for BJTs: base, collector and emitter. BJTs and J-FETs have no body terminal. The names of the terminals refer to their function. The gate terminal may be thought of as controlling the opening and closing of a physical gate. This gate permits electrons to flow through or blocks their passage by creating or eliminating a channel between the source and drain. Electrons flow from the source terminal towards the drain terminal if influenced by an applied voltage. The body simply refers to the bulk of the semiconductor in which the gate, source and drain lie. Usually the body terminal is connected to the highest or lowest voltage within the circuit, depending on type. The body terminal and the source terminal are sometimes connected together since the source is also sometimes connected to the highest or lowest voltage within the circuit. The FET controls the flow of electrons from the source to drain by affecting the size and shape of a "conductive channel" created and influenced by voltage (or lack of voltage) applied across the gate and source terminals. (For ease of discussion, this assumes body and source are connected). This conductive channel is the "stream" through which electrons flow from source to drain. For either enhancement- or depletion-mode devices, at drain-to-source voltages much less than gate-to-source voltages, changing the gate voltage will alter the channel resistance. In this mode the FET operates like a variable resistor and the FET is said to be operating in a linear mode. This mode is not employed when amplification is needed. If drain-to-source voltage is increased, this creates a significant asymmetrical change in the shape of the channel due to a gradient of voltage potential from source to drain. The shape of the inversion region becomes "pinched-off" near the drain end of the channel. If drain-to-source voltage is increased further, the pinch-off point of the channel begins to move away from the drain towards the source. The FET is said to be in saturation mode. Even though the conductive channel formed by gate-to-source voltage no longer connects source to drain during saturation mode, carriers are not blocked from flowing. Considering again an n-channel device, a depletion region exists in the p-type body, surrounding the conductive channel and drain and source regions. The electrons which comprise the channel are free to move out of the channel through the depletion region if attracted to the drain by drain-to-source voltage. The depletion region is free of carriers and has a resistance similar to silicon. Any increase of the drain-to-source voltage will increase the distance from drain to the pinch-off point, increasing resistance due to the depletion region proportionally to the applied drain-to-source voltage. This proportional change causes the drain-to-source current to remain relatively fixed independent of changes to the drain-to-source voltage and quite unlike the linear mode operation. Thus in saturation mode, the FET behaves as a constant current source rather than as a resistor and can be used most effectively as a voltage amplifier. In this case, the gate-to-source voltage determines the level of constant current through the channel. Neurons (also known as neurones and nerve cells) are electrically excitable cells in the nervous system that process and transmit information. In verterbrate animals, neurons are the core components of the brain, spinal cord and peripheral nerves. Neurons are typically composed a soma, or cell body, a dendritic tree and an axon. The majority of vertebrate neurons receive input on the cell body and dendritic tree, and transmit output via the axon. However, there is great heterogeneity throughout the nervous system and the animal kingdom, in the size, shape and function of neurons. Neurons communicate via chemical and electrical synapses, in a process known as synaptic transmission. The fundamental process that triggers synaptic transmission is the action potential, a propagating electrical signal that is generated by exploiting the electrically excitable membrane of the neuron. This is also known as a wave of depolarization. 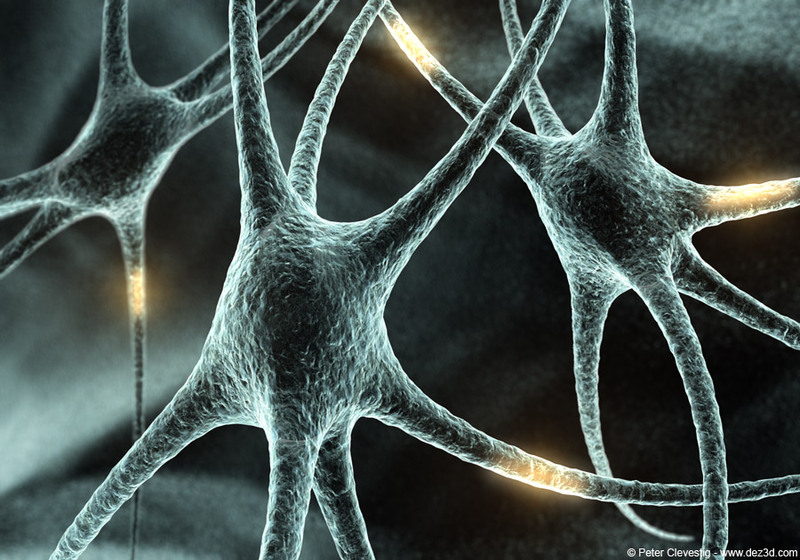 Neurons are highly specialized for the processing and transmission of cellular signals. Given the diversity of functions performed by neurons in different parts of the nervous system, there is, as expected, a wide variety in the shape, size, and electrochemical properties of neurons. For instance, the soma of a neuron can vary from 4 to 100 micrometers in diameter. The soma is the central part of the neuron. It contains the nucleus of the cell, and therefore is where most protein synthesis occurs. The nucleus ranges from 3 to 18 micrometers in diameter. The dendrites of a neuron are cellular extensions with many branches, and metaphorically this overall shape and structure is referred to as a dendritic tree. This is where the majority of input to the neuron occurs. Information outflow (i.e. from dendrites to other neurons) can also occur, but not across chemical synapses; there, the backflow of a nerve impulse is inhibited by the fact that an axon does not possess chemoreceptors and dendrites cannot secrete neurotransmitter chemicals. This unidirectionality of a chemical synapse explains why nerve impulses are conducted only in one direction. The axon is a finer, cable-like projection which can extend tens, hundreds, or even tens of thousands of times the diameter of the soma in length. The axon carries nerve signals away from the soma (and also carry some types of information back to it). Many neurons have only one axon, but this axon may - and usually will - undergo extensive branching, enabling communication with many target cells. The part of the axon where it emerges from the soma is called the 'axon hillock'. Besides being an anatomical structure, the axon hillock is also the part of the neuron that has the greatest density of voltage-dependent sodium channels. This makes it the most easily-excited part of the neuron and the spike initiation zone for the axon: in neurological terms it has the greatest hyperpolarized action potential threshold. While the axon and axon hillock are generally involved in information outflow, this region can also receive input from other neurons. The axon terminal is a specialized structure at the end of the axon that is used to release neurotransmitter chemicals and communicate with target neurons. Although the canonical view of the neuron attributes dedicated functions to its various anatomical components, dendrites and axons often act in ways contrary to their so-called main function. Axons and dendrites in the central nervous system are typically only about a micrometer thick, while some in the peripheral nervous system are much thicker. The soma is usually about 10–25 micrometers in diameter and often is not much larger than the cell nucleus it contains. The longest axon of a human motorneuron can be over a meter long, reaching from the base of the spine to the toes. Sensory neurons have axons that run from the toes to the dorsal columns, over 1.5 meters in adults. 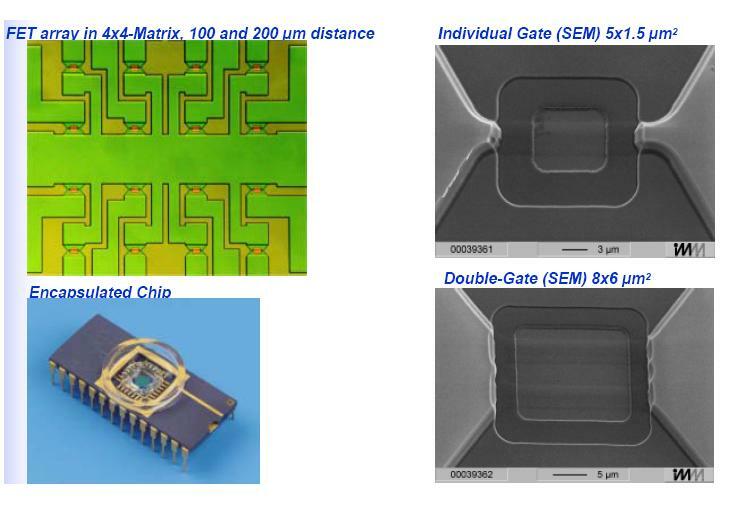 The integration of neuronal dynamics and digital electronics require the understanding of cell-silicon junctions. In this section, the interfacing of individual nerve cells and silicon microstructures are demonstrated. 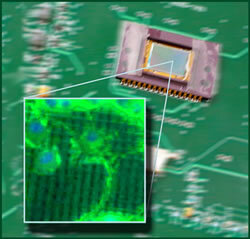 At this interface, capacitive stimulation from the chip is utilized to elicit neuronal activity. Also, a FET transistor is utilized to record neuronal activities. After understanding the basics, this section shows how pairs of nerve cells are coupled to a chip. The electrical activity of a nerve cell is defined by its action potentioal, which is created by a fast opening of sodium channels with a concomitant current into the cell and a delayed opening of potassium channels with a compensating outward current. 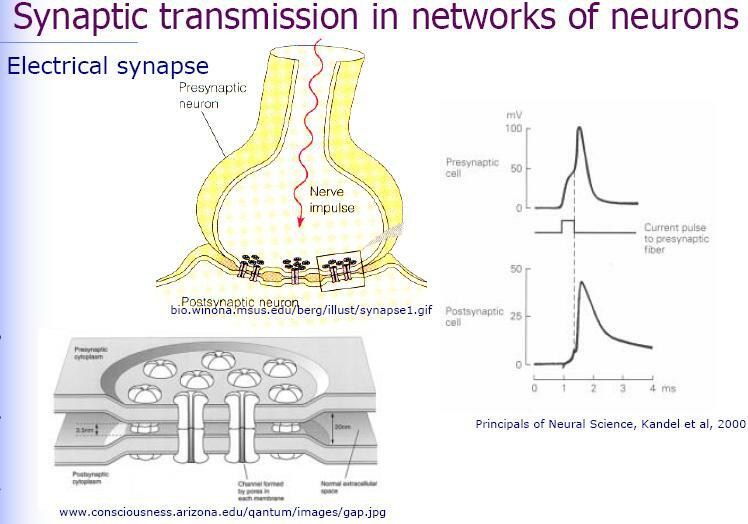 The neuronal excitation dirves ionic and capacitive current through the membrane attached to a chip. That current is squeezed through the cleft between cell and chip and gives rise to a Transductive Extracellular Potential that is recorded by a transistor. Neuronal activity is detected by field-effect transistors. The response is rationalized by a Transductive Extracellular Potential in the cell-chip contact that plays the role of a gate voltage. 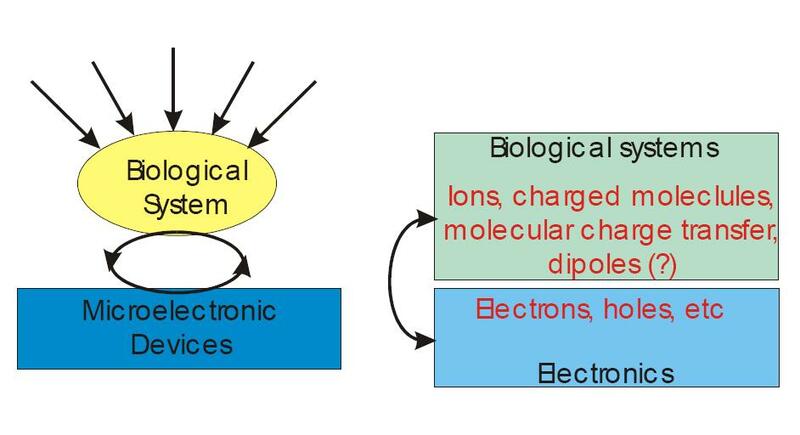 There is no unique response to action potentials, the shape of the extracellular record depends on the cell type and the cell area attached to the chip. The amplitude of the extracellular records is small, because the junction conductance is high compared to the effective ion conductances in the contact. The signals are particularly weak for mammalian neurons due to their small size. Three methods can be utilized to optimize recording: first, its resistance can be enhanced by reducing the width of the cleft. Second, the inhomogeneity of channel distribution can be enhanced by using recombinant methods. At last, the transistor noise can be lowered by choosing improved design and fabrication. A changing voltage applied to a stimulation spot beneath a neuron leads to capacitive current through the insulating oxide. The concomitant current along the cleft between cell and chip gives rise to a Transductive Extracellular Potential beneath the neuron. As a result voltage-gated ion channels may open in the membrane and an action potential may arise. The concept of a core-coat conductor can guide a rationalization of capacitive stimulation of neuuronal activity on silicon chips. But the situation is less clear than with transistor recording. Optical recording directly reveals that fast voltage transients actually exist in the attached and free membrane. But how those transients affect the cell is uncertain: current injection through a leaky membrane, capacitive gating of ion channels, and transient electroporation are diffcult to distinguish. 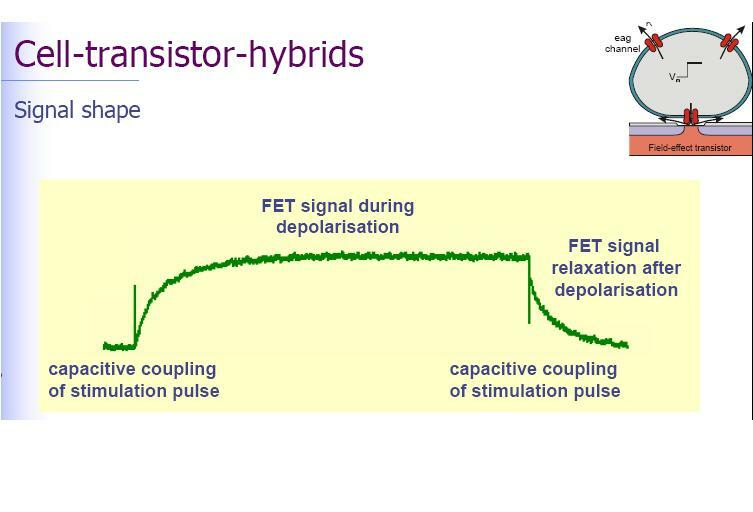 Further studies on neuronal excitation are requied with a recording of the local voltage by transistors or voltage-sensitive dyes, comparing voltage-clamp and current-clamp. Detailed studies on the capacitive gating of ion channels and on electroporation will be most helpful. An optimized stimulation may be achieved by lowering the junction conductance, by inserting recombinant ion channels into the junction, and by fabricating stimulation spots with an enhanced specific capacitance. Two hybrid circuits with two neurons on a silicon chip are considered: the signal transmission from a neuron through a chip to another neuron (neuron-chip-neuron), and the signal transmission from the chip through two synaptically connected neurons back to the chip (chip-neuron-neuron-chip). In the neuron-chip-neuron configuration, a field effect transistor probes the extracellular voltage in the junction between the first cell and the chip as caused by the membrane currents of an action potential. Capacitive stimulation induces a voltage in the junction of the second cell to elicit neuronal excitation by activating membrane conductances. The silicon processing unit accomplishes five taks. First, the source-drain current of the transistor is transformed to a voltage and amplified. Second, the response to an individual action potential is identified by a threshold device. Third, a delay line is started. Fourth, a train of voltage pulses is generated and applied to a capacitive stimulator. At last, the crosstalk from stimulator to transistor in the chip is eliminated by a refractory circuit: the delay line is not started directly by the output of the Scmitt-trigger, but by the onset of a flip-flop as triggered by an action potential. The flip-flop is reset after stimulation. In the silicon-neuron-neuron-silicon configuration, two neurons are selected which are connected by an electrical synapse and which are placed on two-way junctions. A burst of seven pulses is applied to excite neuron 1 as checked with an impaled micropipette. In neuron 2 a subthreshold postsynaptic depolarization is observed. A second burst of voltage pulses elicits another action potential in neuron 1 and leads to a further depolarization of neuron 2. After the third burst, which fails to stimulate neuron 1, the fourth burst gives rise to an action potential in neuron 1 which finally leads to a postsynaptic excitation in neuron 2. That postsynaptic action potential is recorded by the transistor underneath neuron 2, completing an electronically interfaced monosynaptic loop. Ion channels are pore-forming proteins that help to establish and control the small voltage gradient across the plasma membrane of all living cells by allowing the flow of ions down their electrochemical gradient. They are present in the membranes that surround all biological cells. An ion channel is an integral membrane protein or more typically an assembly of several proteins. Such "multi-subunit" assemblies usually involve a circular arrangement of identical or homologous proteins closely packed around a water-filled pore through the plane of the membrane or lipid bilayer The pore-forming subunit(s) are called the α subunit, while the auxiliary subunits are denoted β, γ, and so on. While some channels permit the passage of ions based solely on charge, the archetypal channel pore is just one or two atoms wide at its narrowest point. It conducts a specific species of ion, such as sodium or potasium, and conveys them through the membrane single file--nearly as quickly as the ions move through free fluid. In some ion channels, passage through the pore is governed by a "gate," which may be opened or closed by chemical or electrical signals, temperature, or mechanical force, depending on the variety of channel. Because "voltage-gated" channels underlie the nerve impulse and because "transmitter-gated" channels mediate conduction across the synapses, channels are especially prominent components of the nervous system. Indeed, most of the offensive and defensive toxins that organisms have evolved for shutting down the nervous systems of predators and prey (e.g., the venoms produced by spiders, scorpions, snakes, fish, bees, sea snails and others) work by plugging ion channel pores. In addition, ion channels figure in a wide variety of biological processes that involve rapid changes in cells, such as cardiac, skeletal, and smooth muscle contraction, epithelial transport of nutrients and ions, T-cell activation and pancreatic beta-cell insulin release. In the search for new drugs, ion channels are a favorite target. Instead of culturing defined neuronal nets by controlled outgrowth, neuronal nets taken from brain tissues may be utilized. Considering the planar nature of semiconductor chips, planar networks are preferred in order to attain an adepquate supervision by the chip. Organotypic brain slices are particularly promosing as they are only a few cell layers thick and conserve major neuronal connections. 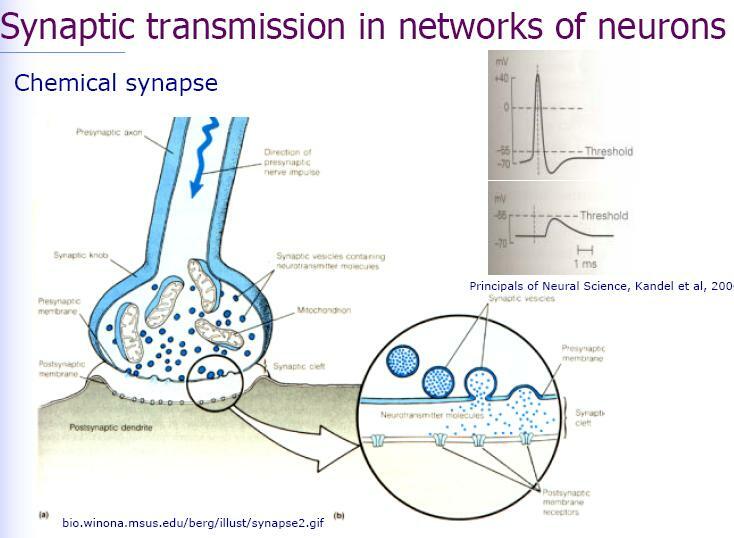 An interfacing of a transistor or stimulation spot with an individual neuron in neuronal tissue can hardly be achieved. Thus with brain slices, the stimulation and recording of local populations of neurons have to be considered. The concept of a core-coat conductor of individual cells is not adequate. 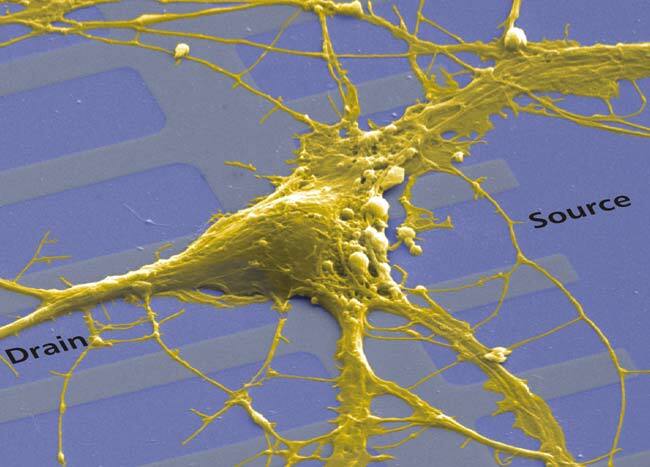 In this chip, neuronal currents in a slice to the extracellular potential that is recorded by transistors and the capacitive stimulation currents from a chip to the extracellular potential that elicits neuronal excitation of the tissue. Microfluidics deals with the behavior, precise control and manipulation of microliter and nanoliter volumes of fluids. It is a multidisciplinary field comprising physics, chemistry, engineering, and biotechnology, with practical applications to the design of systems in which such small volumes of fluids will be used. The behavior of fluids at the microscale can differ from 'macrofluidic' behavior in that factors such as surface tension, energy dissipation, and fluidic resistance start to dominate the system. Microfluidics studies how these behaviors change, and how they can be worked around, or exploited for new uses. At small scales (channel diameters of around 10 to several hundred micrometers) some interesting and unintuitive properties appear. The Reynold number, which characterizes the presence of turbulent flow, is extremely low, thus the flow will remain laminar. Thus, two fluids joining will not mix readily via turbulence, so diffusion alone must cause the two fluids to mingle. These technologies are based on the manipulation of continuous liquid flow through microfabricated channels. Actuation of liquid flow is implemented either by external pressure sources, external mechanical pumps, integrated mechanical micropumps, or by electrokinetic mechanisms. 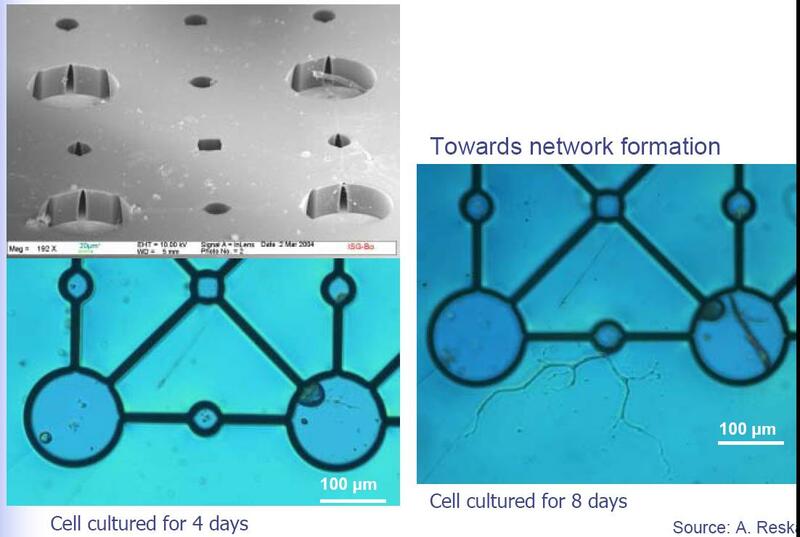 Continuous-flow microfluidic operation is the mainstream approach because it is easy to implement and less sensitive to protein fouling problems. Continuous-flow devices are adequate for many well-defined and simple biochemical applications, and for certain tasks such as chemical separation, but they are less suitable for tasks requiring a high degree of flexibility or complicated fluid manipulations. These closed-channel systems are inherently difficult to integrate and scale because the parameters that govern flow field vary along the flow path making the fluid flow at any one location dependent on the properties of the entire system. Permanently-etched microstructures also lead to limited reconfigurability and poor fault tolerance capability. 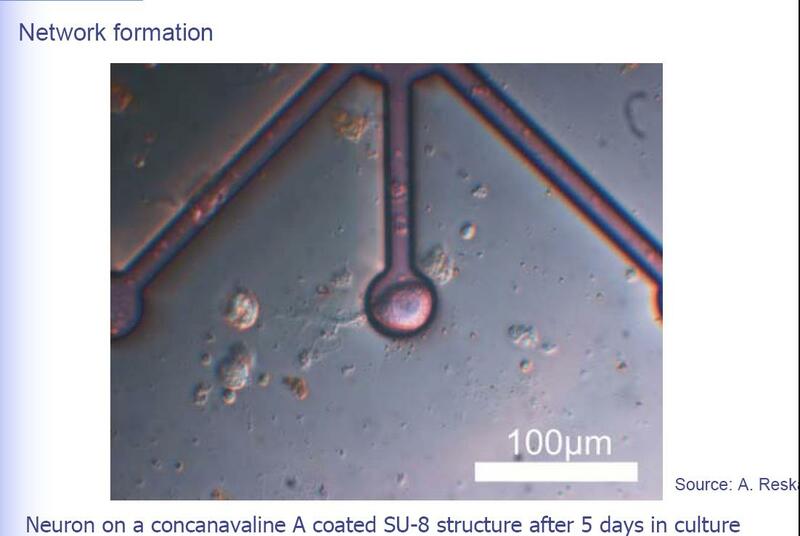 Alternatives to the above closed-channel continuous-flow systems include novel open structures, where discrete, independently controllable droplets are manipulated on a substrate. Following the analogy of microelectronics, this approach is referred to as digital microfluidics. By using discrete unit-volume droplets, a microfluidic function can be reduced to a set of repeated basic operations, i.e., moving one unit of fluid over one unit of distance. This "digitization" method facilitates the use of a hierarchical and cell-based approach for microfluidic biochip design. Therefore, digital microfluidics offers a flexible and scalable system architecture as well as high fault-tolerance capability. Moreover, because each droplet can be controlled independently, these systems also have dynamic reconfigurability, whereby groups of unit cells in a microfluidic array can be reconfigured to change their functionality during the concurrent execution of a set of bioassays. 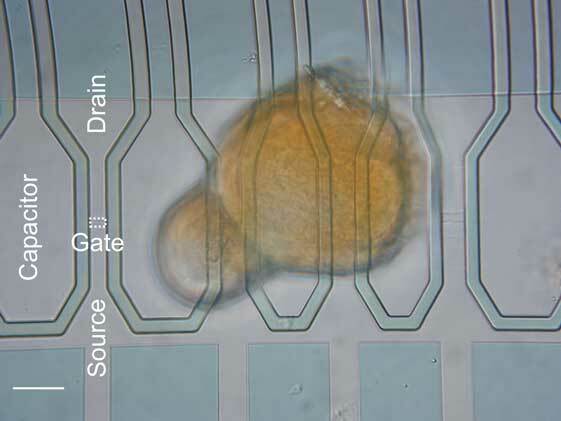 One common actuation method for digital microfluidics is electrowetting-on-dielectric (EWOD). One limiting factor for applying EWOD to biological samples is the surface fouling due to proteins severely damages the controllability of droplets. Another recently developed technology is based on acoustically induced droplet transport employing Surface Acoustic Waves. 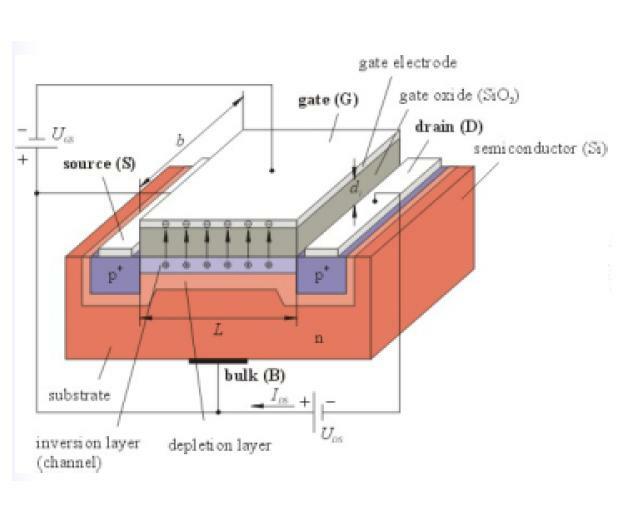 Thus far, this webpage has shown the fundamental issues of neuron-silicon interface, which include the nature of the core-coat conductor, the properties of cleft, the role of accumulated ion-channels, the mechanism of transistor recording and capacitive stimulation. For this technology to be useful, several optimizations need to be implemented in the near future. First, on the side of the semiconductor, the capacitance of the stimulation contacts must be enhanced and the noise of the transistors has to be lowered. Second, on the side of the neurons, the structural and electrical properties of the cell membrane in the neuron-silicon junction must be studied and optimized by recombinant methods. For the implementation of neuronal networks and digital microelectronics, two directions may be pursued in the future. First, small defined networks of neurons from invertebrates and mammals must be created with learning chemical synapses and with a defined topology of synaptic connections. Second, large neuronal nets may be grown on closely packed arrays of two-way interface contacts, such tath the rearranging structure and dynamics of the net is under continuous control of the chip. An adaptation of the industrial standard of CMOS technology will be crucial. The availability of involved integrated neuroelectronic systems will eventually help to unravel the nature of information processing in neuronal networks and will give rise to new and fascinating physical-biological-computational questions.